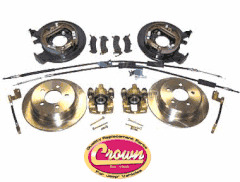 Disc Brake Conversion Kit, D35DISC Fits 1997-06 TJ Wrangler, 1993-98 ZJ Grand Cherokee with a Dana 35 rear axle from drum brakes to disc brakes. 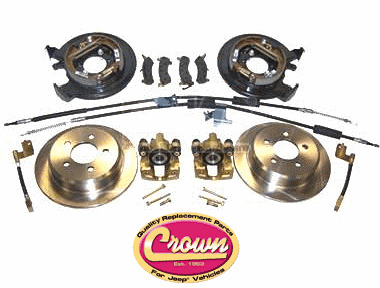 Home > Disc Brake Conversion Kit, Fits 1997-06 TJ Wrangler, 1993-98 ZJ Grand Cherokee with a Dana 35 rear axle from drum brakes to disc brakes. Disc Brake Conversion Kit, Fits 1997-06 TJ Wrangler, 1993-98 ZJ Grand Cherokee with a Dana 35 rear axle from drum brakes to disc brakes. Kit Includes: Pads, Rotors, Parking Brake Assembly, Calipers, Mounting Brackets, Brake Hoses, Parking Brake Cables and Hardware. A MUST for vehicles with oversize tires. There is no drilling or fabrication needed. Greatly improves the braking of Jeep® Vehicles.